Welcome to Island Hopper! I hope you will discover lots about Phillip Island and the surrounding area. This month we "unearth" a little known piece of the island's history. Walking along the sandy tracks on Cape Woolamai you may not realise that underneath is a mass of pink granite, although the 100 metre cliffs along the eastern and southern sides do give a clue to this foundation. And this Cape Woolamai pink granite has a number of admirable characteristics - it is water resistant, an attractive colour and amenable to a fine polish. Consequently, in 1891 a granite quarry was established on the northern side of the cape, on Cleeland Bight, to provide stone for Melbourne buildings. Today it is still possible to visit the quarry, but only at low tide. Visitors can see on some granite blocks the drill holes used to split the stone, a method called “plug and feather”. Holes with a 1” diameter and 4” deep were drilled by hand, and possibly by power driven drills, which were available at that time. Steel “feathers” (like a pipe cut in half) were put into the hole and then an iron “plug” pushed between the feathers. The plug was then hammered until the rock split. A jetty was built of granite blocks from which to load ships. The remains of this jetty can still be seen. Vessels would come in on the high tide. At low tide granite blocks would be brought on trolleys along a tramline and loaded with a crane. With the return of the high tide the ship re-floated, and the cargo taken to Little Dock, near Spencer Street, Melbourne, a two day trip. Quite a few trips were made to Melbourne with a load of granite. However disaster struck on December 10, 1892 with the sinking of the Kermandie. The Kermandie had left the quarry with a load of granite in its hold and also strapped on the deck. She then had a cargo of wool loaded in San Remo. After sheltering from bad weather at Rhyll for a few days, she set out for Melbourne despite further dire weather forecasts. Possibly due to the weather, or because of shifting cargo, or a combination of both, she disappeared. It was soon after the sinking of the Kermandie that the quarry was closed. 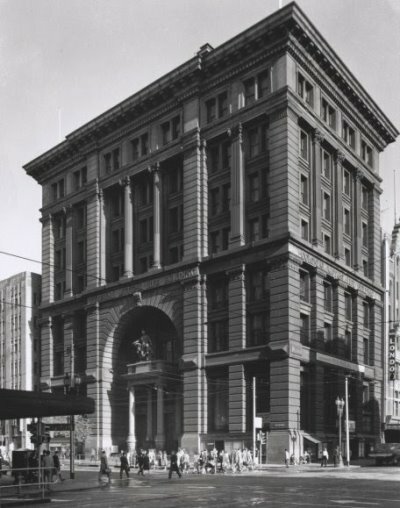 It appears that the Cape Woolamai granite that did reach Melbourne was used for only one building – the Colonial Mutual Life building built by Equitable Life Assurance of the USA, on the corner of Collins and Elizabeth Streets. Cape Woolamai granite was used in the base-courses and also in the impressive portico. Unfortunately, the building was demolished in 1960, one of the many fine old Melbourne buildings which suffered this fate at that time. Some of the salvaged pink granite is at the Melbourne Museum and the statue from the portico is now at Melbourne University, near the Baillieu Library. On Phillip Island, granite blocks can be seen in Cowes at the town square and in front of the Library. Meanwhile, left on the beach today near the old quarry jetty are piles of granite blocks, silent witness to this enterprise, waiting for the ship that will never come. 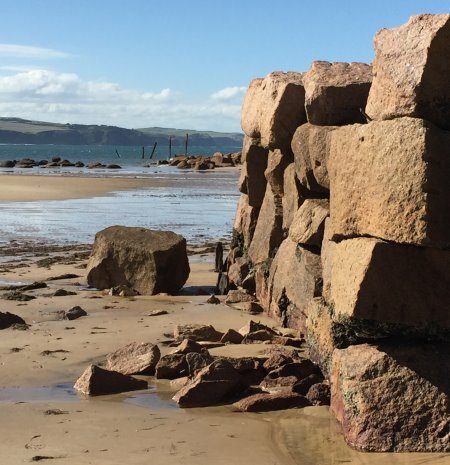 After visiting the quarry, continue walking along the Cleeland Bight beach to the short track back across the dunes to the Woolamai Beach car park. As winter approaches, thoughts of hearty, warming food start to creep into my mind. 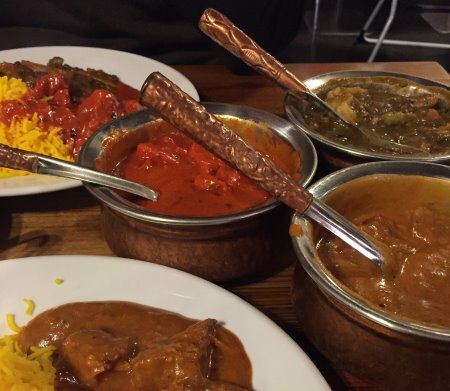 I am a fan of a good curry and Indian food is mostly gluten free, except for the obvious such as samosas and naan, so it’s a great option for coeliacs. Recently we went to Cowes Tandoori Indian Restaurant to try some authentic Indian food. The décor isn’t anything to write home about but this was made up by the food and staff. I imagine you would need to reserve a table in summer as it was very busy, even on a quiet autumn evening. Apart from the restaurant dining, there is take-away available as well. A chilli symbol on the menu helps guests select the curry “heat” to suit their own taste. We ordered several curries plus dhal and rice. All were tasty with plenty of flavour. Serves didn’t seem to be very big at first but somehow we felt that we had eaten enough. The wine list is small and fairly basic with inexpensive choices. Because it was busy, with full tables plus plenty of take-away customers, service was a bit slow. This was made up for by the staff who were unfailingly friendly and helpful. Want to see some fur seals? Don’t have time to go to Seal Rocks? Then follow the signs to the Newhaven Jetty on Woody Point. At low tide, walk to the end of the jetty and look across to the rock ledge island at the edge of the channel, less than 100 metres away. Often there are a few seals basking in the sun or just having a breather. And if they seem to be waving to you, they are actually cooling themselves by waving their flipper across their body to create a breeze. 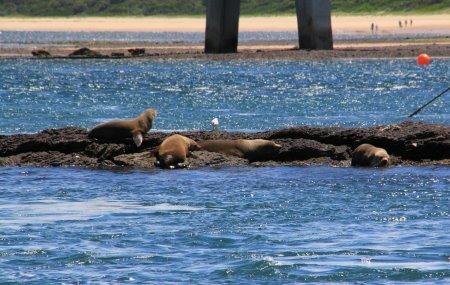 I first became aware of them there when taking the Ecoboat tour to Cape Woolamai and now often look for them as we cross the Phillip Island Bridge – not when I’m driving of course!